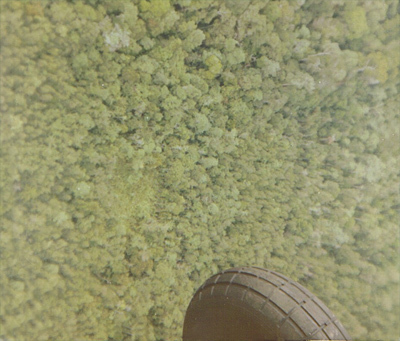 Here are some evocative images from Gerald Law - helicopter operations in Borneo. 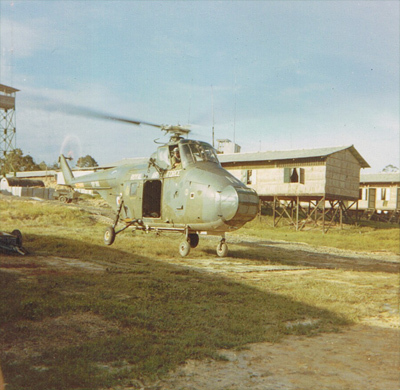 Belvedere with underslung Whirlwind at Kuching. 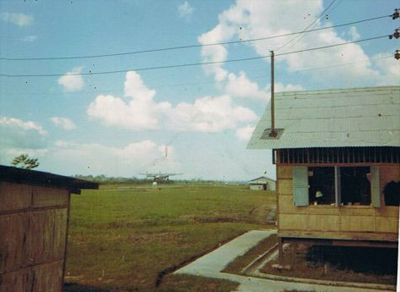 Kuching Basha Hut with Twin Pioneer in background. Take off from Kuching Whirlwind dispersal. The Ulu from a Whirlwind - note the winch. 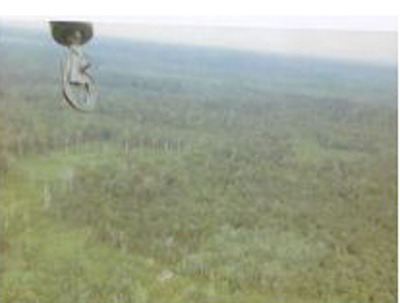 View of jungle from Whirlwind helicopter cabin. 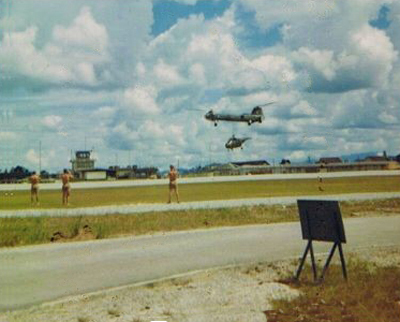 View of Kuching Whirlwind dispersal. 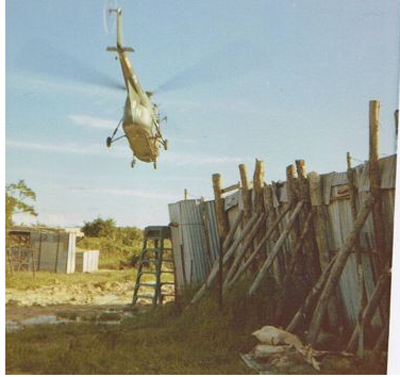 Whirlwind gets airborne at Balai Ringin. Paul has sent us three piccies with some appropriate comments! Do these bring back memories or what! They were taken in Kuantan. "I send you this photo just to show that not all damage was done by the enemy. Mother Nature could have a good go at us, too. This was all that was left of our field kitchen after the storm and we still fed the lads on time. 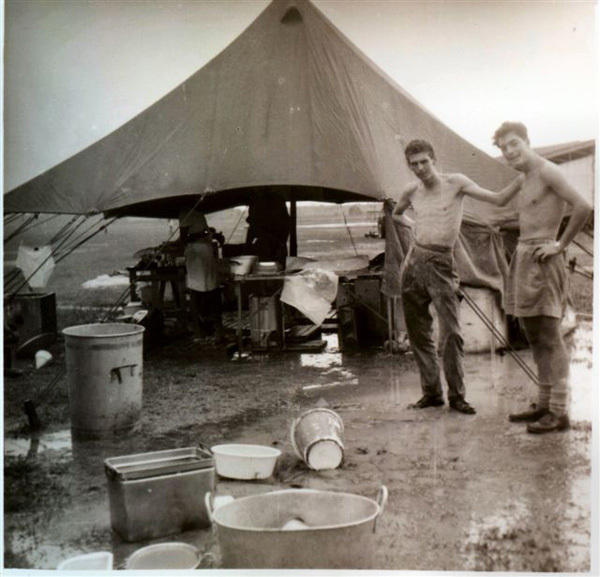 An aircraft made an approach to land after the storm with the runway flooded he radioed in 'unable to land I'm flying a Beverly not a F***** Sunderland' (that's a Flying boat) and he went back to Singapore with our rations." Left Cpl Chef John, in the middle at the rear Fireman Pete, right my best mate Jimmy James. Paul has kindly sent in a photograph of Denis Healey during his visit to the Far East when he was British Defence Minister. Lord Healey is a staunch supporter of the Fight4thePJM and our campaign for the right to wear the PJM. 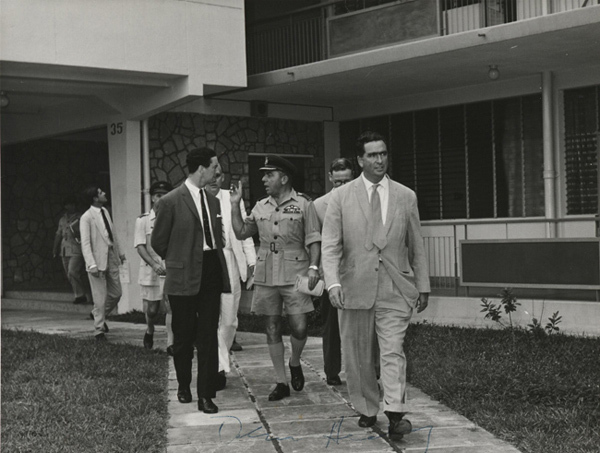 Denis Healey and other MPs coming out of my Billet RAF Tengah, Singapore. I do not know who the other MPs are. Wonderfully evocative images, Paul. Thanks very much for sending them in. 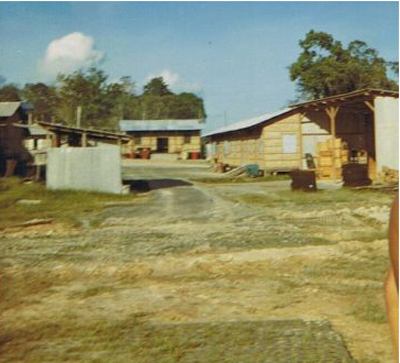 "I joined the Malay Police in 1952, and my first posting was to Kuantan airport, where along with a seasoned Police officer, who more or less was overall i/c of the airport we shared a wooden hut close to the main gate. At the time the airfield was littered with Japanese bombs lying around of which the cts would attempt to take. I was only there for about three weeks, before I was posted to a dicey area of Kuantan. Thanks for showing the pics, they brought back a few memories. 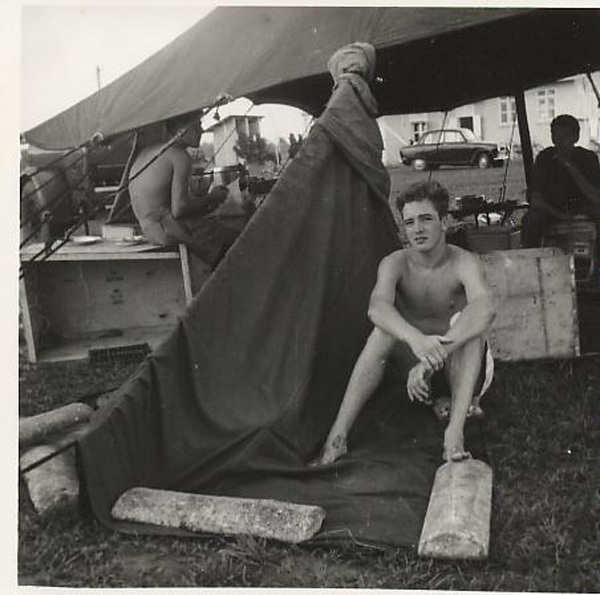 Roy"
Message=On one occasion we flew 'up country'with a platoon of Ghurkas and headed up to Kuantan in Malaya. We flew from Changi in DC2's the flight was known as 'Christmas Airways' as they had recently been transfered from there to Changi. As we approached Kuantan airstrip we had to climb over a range of mountains then. 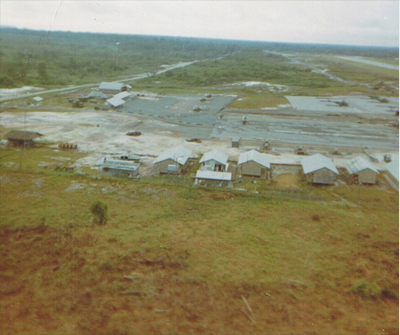 as the airstrip appeared below, the aircraft plummeted earthwards. The Ghurkas were on their knees praying! The poor lads thought their number was up. Suddenly the airstrip appeared before us and after a bumpy touchdown we landed to sighs of relief (in Ghurkali of course). We got the gist of it! 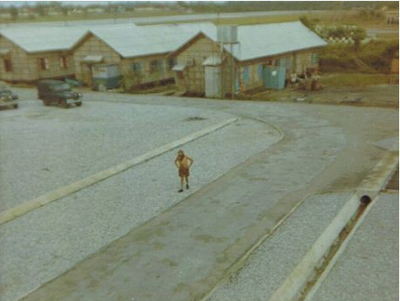 This airstrip had been cut to bisect an old Japanese WW2 landing strip, the only way the pilot could land us safely was to climb the aircraft then DROP!! web site. 656 has a very long association with Malaysia and flew more than 150,000hrs on operations during the Emergency years. More than all other squadrons combined. You might like to also look at my personal web site"The Janvision Gallery". Comment =I support your cause unreservedly. 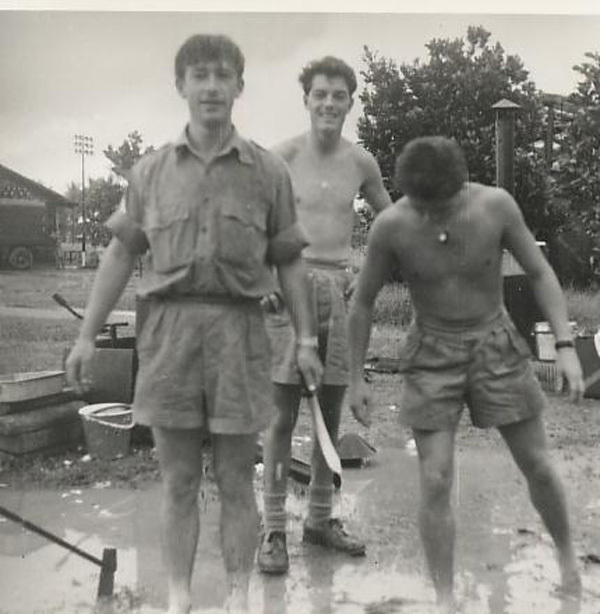 I served in the Malayan campaign from 1956-59, with 205/209 squadron. I still have a deep affection for the memories of those days and for the friendships that still exist. I will wear the medal with pride today, as I wore the uniform of my country all those years ago. keep up the fight and call on me at anytime , if you need practical support.